I was once browsing the computer games section of Blockbuster trying to find a PS2 game. This is something I no longer do as I do not play computer games anymore (the last time I bought and played a computer game was in 2006). This is all because the last game (it shall remain unnamed) destroyed my life. The epiphany occurred when I awoke from a trance early one morning. I was surprised to discover that I was sitting cross-legged on the end of my bed, in my boxers, covered in sweat, tears staining my cheeks, a PS2 controller in my hand and the television on in front of me with the game in question on the screen. It was half 5 in the morning. I had been playing it non-stop for about 12 hours and had lost almost half my bodyweight in sweat. “Should probably stop playing computer games now.” I thought, and that was that. Anyway, back to what I was trying to say. 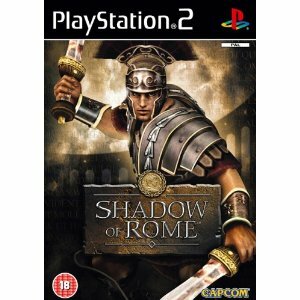 I was browsing the computer games, and I came across one called Shadow of Rome – I had never heard of it, but it was an 18 so I bought it. I played it twice and then never picked it up again. Now and again I’ll glance at it whilst browsing my 18s but that’s about it. YOU LIVE AND LEARN, NEIGHBOURINO, YOU LIVE AND LEARN. This entry was posted in 18 Related Anecdotes, 18s and tagged blockbuster, computer games, shadow of rome. Bookmark the permalink.